Me and that Andy fella, we're so garishly green that we don't need to prove it each and every week by riding our bikes to an eating establishment. Not when we can walk to the electric vehicle charging point (one of two at Adastral) before jumping into a VW BlueMotion with a start-stop system. None greener, my friends, like two peas in a pod. Fuel-efficient foot-down past pile-'em-high Wyevale and revvin' right-turn past the sublime Cook's Shed, over the lights and here we are, downwind of Five Winds Farm. 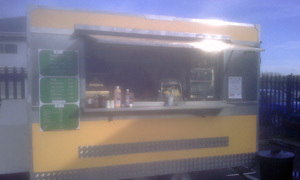 Big flappy sign shouts Hot Snacks outside Poppy's Pantry, a brightly painted burger van sitting out front. While the short order chef was prep-ing our ADB orders, time for a nose in the eco supply store. Joe Jackson would have observed the "soul food, good food, whole food" on every shelf and in every fridge. Simply walking around that place has been known to reduce your bad cholestorol. Talking of which, and temporarily ignoring yesterday's free NHS healthcheck, here's our baps of locally sourced bacon and egg: smells and tastes mighty fine. Internal seating area has odd toys, art equipment, books, you name it, and, handily, a bunch of chairs. Hadn't realised that Poppy's, like Jamie Oliver's 15 and the Co-op Education Centre, is a social enterprise, offering job training for folks with learning disabilities. Makes that bacon slide down even better. Laminated A5 slip on our table is crying out for our attention: tea and homemade cake for two, £2.50. Bargainous. Sorry, says Mr Poppy, all out of cake today, but please choose a flapjack or something else instead. Eat Natural cranberry and chocolate bar, times two. Lack of sponge is more than compensated for by the presentation of china teacups and a teapot on a tray. Our late friend Grenvyle would have very much approved. If it was a car -- Ford Popular. If they were passing by -- Andrew Poppy.